It’s no secret that the Eagles lack speed on offense. Free agent wide receiver Cordarrelle Patterson could be a cheap, underrated option to fix that problem. After former head coach and general manager Chip Kelly purged the Philadelphia Eagles roster of electric play makers like DeSean Jackson, LeSean McCoy and Jeremy Maclin, the Eagles have rarely seen big plays down the field. 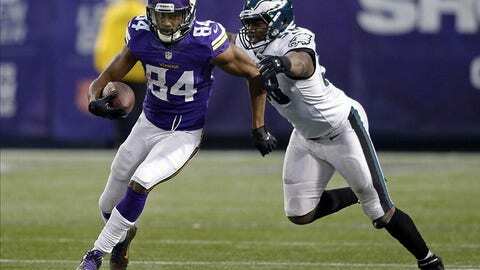 An option for the Eagles to build that speed back is free agent return specialist Cordarrelle Patterson. Patterson, a former first-round pick in 2013 of the Minnesota Vikings, has made a name for himself around the NFL as one of the best return specialists in the league. In 2016, Patterson was first in average yards per kickoff return, averaging 31.7 with the Minnesota Vikings. He received his second Pro Bowl nod as a returner for the NFC. Playing in four seasons with the Vikings, Patterson had five kickoff return touchdowns, including returns of 109, 104 and 101 yards. The former Hoosier receiver would also fit perfectly at the hybrid role on offense that was recently held by Josh Huff. Huff was arrested in November on speeding charges while also possessing marijuana and a loaded gun not permitted in the state of New Jersey. Howie Roseman decided to cut ties with the former Oregon star. The Eagles play calling suffered, becoming conservative and limited with the personnel on the field. Head Coach Doug Pederson, like his mentor Andy Reid, has a history of using screen plays, reverses, and trick plays frequently in his playbook. Huff was the go-to weapon for these plays. Without him, the offense took a significant step back. Signing Patterson would give the Eagles that element of their offense back. Despite being used in a very limited role in Norv Turner’s offense, Patterson still finished the season with five plays of 20 yards or more on offense. If Darren Sproles retires after the 2017 season as previously reported, Patterson not only would replace him as the go to punt returner, but he is also open to playing running back. With only 31 career carries, six of them have been runs of 20+ yards, including two of 40+. Signing Patterson isn’t about finding a potential starting wide receiver, it is simply adding speed to an offense that, outside of Sproles, has no explosive players. A stat by Reuben Frank of Comcast Sports Network, tells the story of just how badly this Eagles team needs play makers. When looking at contract details, Patterson would probably cost around $3 million per year, with the likes of Cole Beasley, Chris Hogan, and Dwayne Harris all in that ball park. Patterson would make the Eagles far more explosive in 2017. His elite return ability would take the Eagles top ranked special teams to even bigger heights.